This resource accompanies the Silly Bunny song. 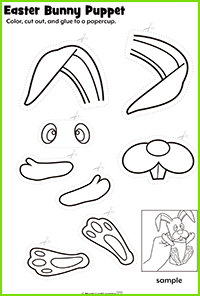 Directions: Color and cut out the bunny’s face and body parts. Get a paper cup, and turn it upside down. Cut the paper cup up the middle and fold it over to create the face, body, and mouth for the puppet. Glue the face and body parts to the folded cup to finish the puppet.